Leilagh Boyle teaches Environmental Studies and Biology at Cottage Grove High School. 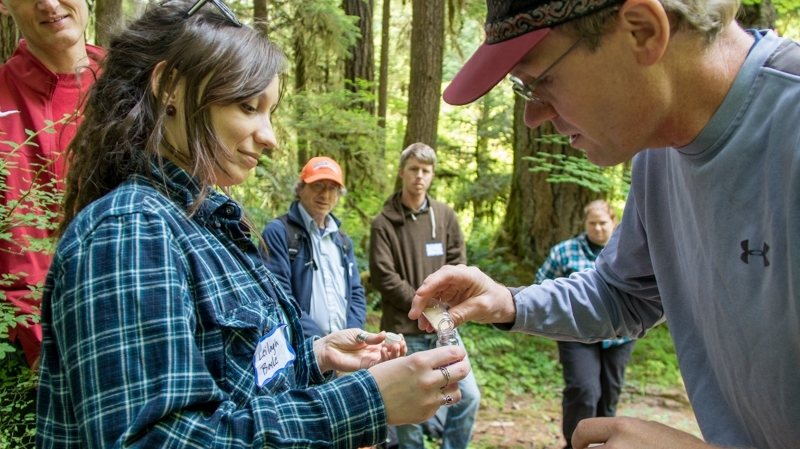 In 2016, Leilagh, and fellow Cottage Grove high school teacher Jessica Flood, came to the Andrews Forest as participants in the NSF-funded Research Experience for Teachers (RET) program. Leilagh and Jessica worked with researchers Ivan Arismendi, Alba Argerich, and Brooke Penaluna on research about the structure and function of aquatic systems at the Andrews Forest LTER site. Now, Leilagh leads her students in several field investigations based on her RET experience including a stream ecology survey, a controlled experiment to test the effect of tile color on algal growth, and an investigation of the role of stream microorganisms in photosynthesis. One of her lesson plans is now online as a "Data Nugget" titled "All washed up? The effect of floods on cutthroat trout." Data nuggets are online "activities that bring real scientific data into the classroom, guiding students through the entire process of science while building their quantitative abilities." The lesson plan includes a teacher's guide, student activities, and images. Also see our RET page and the article: "Numbers in Nature, Math on the Mountain A Teacher–Scientist Partnership to Tell Stories of Place Through Data" for more information on the K12 teacher education programs at the Andrews Forest.